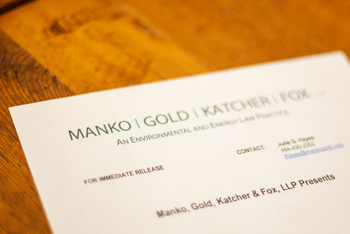 The Environmental Community Service Award, presented by Wawa, 6abc, and the environmental law firm Manko, Gold, Katcher & Fox, LLP (MGKF), celebrates a decade of supporting environmental programs that improve the local community. The goal of the Environmental Community Service Award is to recognize schools (6th grade or higher) for their outstanding programs that enhance and improve the quality of life in their communities as well as raise awareness of environmental concerns. Understanding the importance of encouraging schools to institute environmental programs, media partner 6abc will help increase awareness of the award with their audiences throughout the Delaware Valley. Click here for a copy of the 2015 application. Click here to download a program flier to help spread the word about the award opportunity.